It is interesting to note that the first flag of victory in Berlin was the Polish flag. This was over the Branderburg Gate. While the raising of the Polish flag over Monte Cassino has been photographically immortalized, another event of momentous significance has not. Polish troops of the Kościuszko division, serving under Russian command, were the first to fight their way to the center of Berlin at the end of the World War II. There they raised the Polish flag over the Branderburg gate, only to have it taken down soon thereafter by the Soviets who replaced it with their own red banner. henryk wrote: It is interesting to note that the first flag of victory in Berlin was the Polish flag. This was over the Branderburg Gate. I'm sure that wonderful story has vast factual support. On May 2, 1945, after the capture of Berlin, soldiers of the 7th Battery, 3rd Division, 1st Light Artillery Regiment planted Polish flags on the Berlin Victory Column. From: (Polish) Znamierowski, Alfred (1995). Stworzony do chwały. Warsaw: Editions Spotkania. ISBN 83-71-15055-5. A photograph of the Polish flag hoisted for a few hours on the Victory Column (the Siegessaule) in Berlin was supposed to testify to Polish participation in the defeat of Germany and to obscure the Lublin-based government's dependence on the USSR. To me this is the most important photo I have ever taken. Berlin, Tiergarten, 2nd of May 1945, 6 A.M.. I met today's lieutenant Antoni Jablonski (born 1918) in his premises. A wooden house surrounded by old trees of the vast garden. Polish soldier with Polish Flag On the Victory Column in the Berlin Tiergarten, c May 2, 1945, see page 116 (PAP). CHAPTER ONE: "Our March is towards Poland, Whole, Free and Independent" - The Origins of the Polish Armed Forces Question. When the men of the Polish 1st Division raised the red and white flag over the Brandenburg Gate, they had done so at great cost. Perhaps someone can do a Polish search? How could it be the first flag of victory if it was mounted on May 2? So was the Polish flag raised at the Brandenburg Gate or Siegessäule? I was watching a programme in the Polish TV a few years ago and the story is more complicated. The first Polish flag over Berlin was raised by a Polish soldier who was immediately shot dead by a Soviet soldier as the latter wanted to raise the Soviet flag expecting a great decoration (the Soviet soldiers were competing with other Soviet soldiers who would be the first to raise the flag). Another Polish flag was risen (I suppose it's the one in the photo) but the Soviets ordered to remove it very quickly. Kanadon wrote: How could it be the first flag of victory if it was mounted on May 2? Because the Berlin garrison surrendered on 2nd May 1945. It happened before Germany capitulated. Twix wrote: So was the Polish flag raised at the Brandenburg Gate or Siegessäule? It could have been both as the Soviet soldier killed the Polish soldier in one of these places and replaced the Polish flag with the Soviet one. Soviet banner was up on April 30th. Jablonski achieved revenge on the Soviets, by raising the flag over Berlin. Mr. Antoni was modest, as always. Only specially for this occasion he put on his dress uniform, with military decorations and medals hung. “In my life I never thought I would live to see such a sublime moment. Even more so, since I recently reached 90 years " he said with pleasure, through tears. Jablonski is the most famous resident of Suraż. He was born in 1918. During nearly his entire adult life he was active in the city. However, historical storms caused him to survive many tragic moments, in very remote places. The Second World War found the current honorary citizen residing in Brańsk. In 1939, Mr. Anthoni was only 21 years old. Soon the Soviets forced him into the Red Army. In 1942, during fighting with Germans, Jablonski was wounded. Shot in the leg. he laided for nearly two months in a hospital on the Volga. Mr Antoni also did not miss the hell of Siberia, along with others deported to the Soviet Union. He worked there in a detail operating in the construction of a factory. To this day, he remembers being a forced labourer, using only his strength to work, in great cold and hunger.In 1943 the Tadeusz Kościuszko 1st Division was formed.. Mr. Antoni was conscripted into it, and there got a Polish uniform, and above all, food. “We heard that we will liberate the Polish lands, fighting the Germans. What great joy it was for us” Mr. Jablonski remembers after all these years. Along with the other "Kościuszkowians" he went through the entire course of the war. He had an important role, operating a military radio. He passed on orders to other soldiers, as where to attack. This heroic soldier from Suraż was in the Battle of Lenino. And in the spring of 1944, Mr. Antoni with the Army crossed the Polish border. “Finally, we were on our native land, now it was up to us tear it out of the hands of the Nazis. I remember greeting and hugging our fellow countrymen” he remembers after all these years. The second time Mr. Antoni relived this moment occurred twenty years later, when, in 1965, he was invited to a ceremony in Berlin. But the most unique was a meeting in May 2005 after 60 years. But the modest hero of Suraż was glad, that he could see everything again, for his colleagues did not live to see that event. Only the little Prussian Column has grown older. After the war he worked as a salesman, and then as a postman. For many years he was retired. Jablonski received further military promotions. Honoured with theCross of Valour, the Officer's Cross, the Knight's Cross, Grunwald, etc., he has also medals for the heroic Battles of Warsaw and Berlin. And for many years the picture of the flag raised in Berlin can be found in all school history textbooks. “No one asked us whether we wanted to fight. We walked from front to front, risking our lives” he says. Edit on 2010/02/22 was inserting "pole" in "The wooden flag was"
Last edited by henryk on 22 Feb 2010 18:39, edited 4 times in total. The version about the Victory Column seems more probable. Sorry guys but there is a big mistake in your discussions. This photo with Polish flag over Berlin was made not over Reichstag nor over Brandenburg Gate!... but over Berliner Technische Hochschule, that was transformed by Germans in real fortress and was captured by Polish 1st Infantry Division at dawn May 2nd 1945. There are relations that Polish soldiers raised flags on Reichstag and Brandenburg Gate after surrender of Berlin and that these flags were quickly removed by Soviet soldiers because they didn't know the colours of Polish flag (white and red) and these were similar to colours of German Flag (Kaiser's Germany flag: black-white-red). The are no known any photos of Polish flags over Reichstag, Brandenburg Gate and Siegessaeule during the Berlin storming!!! In Polish Film Chronicle (Polska Kronika Filmowa) no. 15-16-17/1945 titled "The Doom of Berlin" are pictures of Polish flags mounted over Tiergarten Railroad Station and Brandenburg Gate, but these shots are made for propaganda purposes after the battle when the Polish commanders were visiting the battlefield. I conducted a little investigation about Polish flag in Berlin, and this photo was made not on the Berliner Hochschule, but on Siegessaeule. Results of this "investigation" below on three photos. 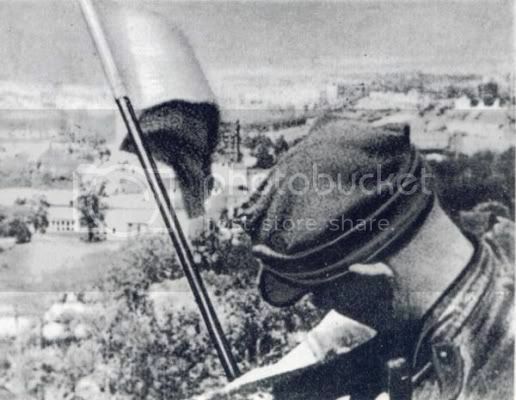 First photo is from 1945 with Polish soldier mounting flag on Siegessaeule. Second photo is a view from Siegessaeule today [it's photo from Google Earth]. And third photo is a 3D view from Siegessaeule [from Google Earth too]. Now who is to believe? Nice example how history is handled in Pl. Are you referring to the photo below? Since you apparently are it must have taken BAZILION hours of editing. Nice example how history is handled in US of A.